The cache is hidden near Sigulda - Ligatne hiking trail. The closest place one can get to the cache with an off-road capable car (or a boat) is Gauja riverside camping site "Berzi". The best way of arriving at the cache location is to walk or cycle the trail from either Sigulda or Ligatne as the distance is almost the same from both ends of the trail. Length of the trail: ~20,5 km. Trail is accessible to both hikers and cyclists. Trail is marked with signs - blue rhombus on white rectangle. Time: cycling ~4,5-5,5 h, hiking ~6-7,5 h.
Difficulty: dirt or gravel trail, mostly flat, several steep hillsides, may have to climb over downed trees, may have to wade in some places during autumn and spring rains. If You notice any garbage laying around while walking the trail, please do pick up at least one plastic bottle and dispose of it later when back in the city. Lets keep our hiking trails clean. 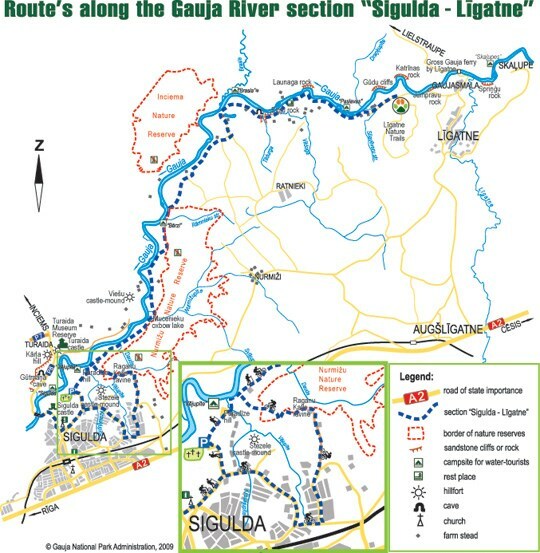 Find out more about Silgulda - Ligatne trail (latvian language) on Gauja National Park website. Vafvqr snyyra zbffl gerr ba n uvyyfvqr. Gerr vf ivfvoyr sebz gur genvy.